Indiana hosts many native fruit species as well as introduced varieties. An orchard in Indiana reflects this, combining native trees and some of the newest developed cultivars. Most of the state is in USDA hardiness Zones 5 and 6, making late spring and early fall frosts the main risk to fruit production. With careful selection for each climate area, growing fruit trees in Indiana rewards the gardener with abundant harvests of delicious, juicy fruits. Indiana has been home to many apple varieties since the days of John Chapman, better known as Johnny Appleseed, in the late 1700s. Certain apple cultivars perform better in northern Indiana and others thrive in southern Indiana. Consider varieties such as Gala, Honeycrisp, Jonathon and McIntosh for the northern areas of the state. For the south, cultivars such as Spartan, Granny Smith and Goldrush make suitable selections. Most apples need a pollinator--another apple tree--to set fruit. The pollinating pair must flower at approximately the same time. For example, early season trees such as Gala and Honeycrisp pollinate one another, while the late season Granny Smith and Goldrush cross-pollinate. A native to the southern half of the state, persimmons (Diospyros virginiana) provide abundant plum-like fruit for the Indiana orchard. Persimmons can grow anywhere in Indiana. Hoosiers commonly use the fall fruit for syrup, jam and pudding, and also eat them fresh from the tree. 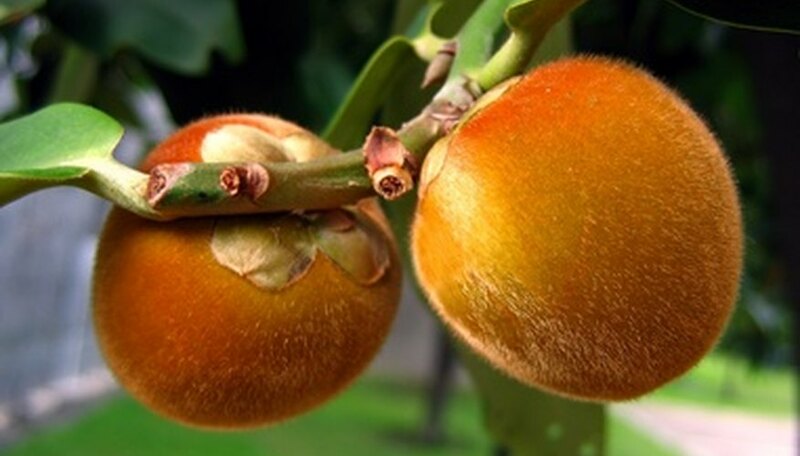 The persimmon tree can reach up to 50 feet high, but usually remains smaller. They have low maintenance requirements and only need to be pruned to remove dead and diseased limbs, or to limit growth. Some varieties to grow in Indiana include the native persimmon, Even Golden, John Rick and Miller. Pollination requires a male and female tree, but only the female bears fruit. Cherry trees can perform quite well in Indiana. In fact, the black cherry (Prunus serotina) is native to the state. Plant tart varieties, such as Montmorency and Meteor, in central and northern Indiana; they prefer the cooler climate and shorter summer. Tart cherries bloom later in the spring, avoiding frost damage. Sweet varieties perform better in southern Indiana. Cultivars of sweet cherries for the state include Rainier, Van and Sam. Tart cherries do not require cross-pollination, but sweet cherries do. You should check which trees work well as pollinators before choosing varieties. For example, Rainier makes an excellent choice to pollinate Sam and Van varieties.